It all started 7 years and 10 months ago (roughly, haha! ), on a hot, hot, super hot evening (by far the hottest day of my life) in August. I was 8 months pregnant and my sweet husband had hired a photographer and convinced me that I NEEDED to have maternity photos done. "If not for you babe, than for our unborn baby girl," he said. Somehow he knew the collective "we" would appreciate having these images later on. Smart guy, right? Anyway, I reluctantly agreed and went along for the shoot. Sweating miserably the entire time; still I persevered. For her. Little did I know, it was that very maternity session that opened my eyes to one of the biggest loves of my life. Photography. Here in Arizona, most of us on-location photographers are forced into hiatus during the summer months. It's just too hot to shoot outside. Which always reminds me of my sweaty maternity session. For years I've been offering in-home lifestyle sessions to families who (like me) happen to have summer pregnancies or summer baby's but I know, in-home sessions are not for every family. 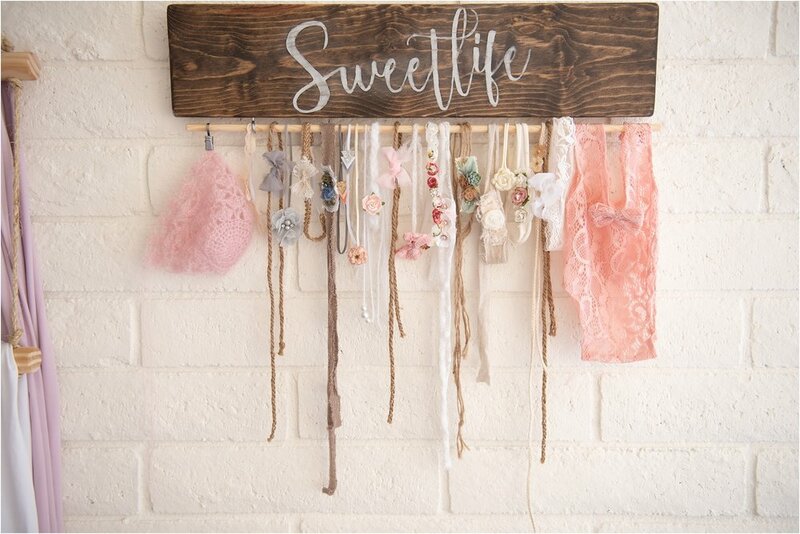 With that in mind, it is with great excitement that I debut Sweetlife Studio : A Neutral North Phoenix photography studio. I have put my heart, soul and muscle (well, to be completely honest, mostly my Hubby's muscle but my vision) into creating my cozy, neutral dream studio that showcases my natural and simple style of photography. We took our dreary 3rd car garage/workshop/"stuff" collection space and converted it to one of my (new) favorite places to be! My residential studio is the perfect location for a fresh, pure and simple portrait session for your maternity, newborn and growing baby. The studio is equipped with A/C (excellent indoor option for summer sessions, amiright? ), wifi, a Mommy lounge/viewing area, soft neutral wraps for your newborn to snuggle up in, dainty tie backs, headbands and delicate bonnets and a handful of neutral, classic props to use during your child's portrait session. Studio sessions are available year round. Give me all the whites, creams, grays with a sprinkling of pastel blues and pinks. There's no need for elaborate backdrop sets or busy prints and patterns. No trendy props or unnatural poses, I stick to timeless white, black and faux wood backgrounds and very minimal prop usage. I want you and your baby/child to be the star of the shoot. My sweet + simple style provides me the ability to create galleries full of classic, tasteful images that never date, never go out of style and you'll never have to worry about your grown son or daughter being embarrassed of their baby photos. That, I promise. I will also be offering in-studio Seasonal Childhood Mini sessions. To give you an idea, this holiday season I'm thinking of hosting a Childhood Christmas Jammies mini session event! Make sure you're on my VIP List to be the first to hear about these! Whatcha think? Ready to book a session? Let's play! Send me a note, I'd love to hear your thoughts!